Clearing the Recent Items List in Windows Vista. In the following simple solution, I’ll show you how to Clear Recent Items on your Windows Vista PC. 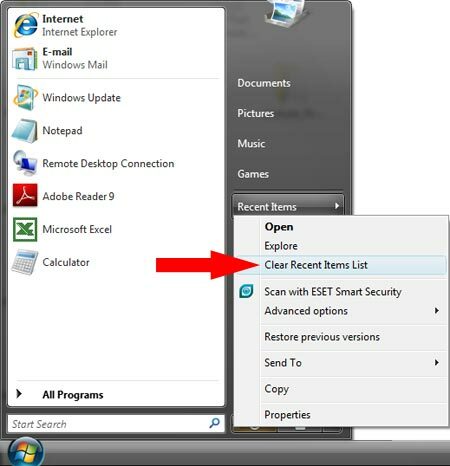 Much like the Windows XP tutorial on how to Clear Recent Documents, clearing your Vista Recent Items is a step towards removing traces of personal browsing history on your PC. The Recent Items List is used to display your most recently accessed files or programs in an effort to make it easier to quickly access those programs or files at a later point in time. If all goes well, your Windows Vista Recent Items List should now be cleared!